Special Containment Procedures: SCP-2226 is to be suspended within the 1,000 T paramagnetic field of a standard antimaterial containment unit1 which must be constantly monitored by at least one antimaterial containment technician and two armed security personnel. The unit housing SCP-2226 must be held within an appropriately sized chamber supplied electricity indefinitely with a power supply connected to at least two backup reactors. The chamber must be lined with a material suitable for blocking the 2.15 kHz radio transmissions broadcasted from SCP-2226. SCP-2226 must be stored at Lunar Site-13. Terrestrial storage would be needlessly problematic as a containment breach during atmospheric reentry would have catastrophic consequences and create immense censorship difficulties. Description: SCP-2226 is an extraterrestrial escape craft composed entirely of antimatter. 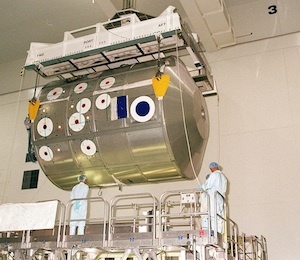 The object is ellipsoid in shape and constructed from an alloy of the antimatter counterparts of iron, tin, and nickel with a mass of 847 kg and semi-principal axes of 4.10 m, 1.72 m, and 1.50 m. It has eight maneuvering thrusters arranged in two sets of four around each of its ends. In the center of SCP-2226 there is a 0.73 m wide circular, transparent hatch through which the object’s interior is visible. The hatch's transparency seems to be only a consequence of its composition, which spectrographic tests reveal to be a form of enameled glass, and not intended to make the surroundings of SCP-2226 visible (see description of SCP-2226-1). Inside SCP-2226 is a compact control panel with several knobs and levers that seem to control the object’s maneuvering thrusters and radio transmitter. In the center of the panel is a tactile display consisting of a rectangular grid of fifty by twenty minute metal pegs which individually raise and lower to indicate internal and external conditions. Underneath the panel is a storage chest containing a small, stringed instrument composed of metal. Resembling a Vietnamese k'ni,3 it consists of a post with a main string running down its length and a sympathetic string attaching the main string to a resonating membrane. The interior floor is littered with fourteen empty metal containers once holding an unidentified purple paste (see event log 2226-B). Beside the control panel is a vaguely humanoid entity resting within what is believed to be a suspended animation chamber. Designated as SCP-2226-1, the entity measures 2.45 m in height. Its skin is a deep mauve and it possesses two pairs of upper limbs and a single pair of lower limbs connected to its torso. Its upper limbs terminate in a hand with seven webbed fingers while its lower limbs terminate in feet with seven shorter digits. SCP-2226-1 lacks a distinct head and instead has its main sensory structures (two large, pteropine4 ears; three nasal slits; one mouth with protruding fangs) centered in its torso. As no eyes or photoreceptive organs are visible5 on the creature's body, it is assumed to perceive its surroundings through echolocation. Its visible teeth suggest a carnivorous or omnivorous diet, though it has only been observed eating onboard provisions. As it hasn't been observed excreting waste it is assumed all metabolic byproducts are released during exhalation. A translucent mask is fitted over the nasal slits and mouth of SCP-2226-1, supplying it an unidentified respiratory gas from a tank beside the chamber estimated at 5.6 L in volume. Given that the tank has not yet been exhausted and appears to be connected to the interior wall, SCP-2226 likely has an onboard system that removes waste products from and recirculates exhaled gas. It is unknown how long the vital processes of SCP-2226-1 will remain in suspension or how long the radio transmitter of SCP-2226 will remain functional. SCP-2226 does not appear to contain any remaining provisions. Event Log 2226-A: Details of event leading to Foundation recovery of SCP-2226 on 05/16/1999. 05:13 Extraterrestrial vessel appears in flash of white light at an altitude of approximately 130,000 m above far side of moon. Vessel is dull grey in color and ellipsoid in shape, with semi-principal axes of approximately 30 m, 17 m, and 15 m. Vessel appears critically damaged with starboard side of hull partially molten and trailing debris. 05:16 Vessel altitude 126,000 m. Five of eight thrusters on the stern of vessel ignite. Vessel achieves acceleration of approximately 16 m/s2. Entity or entities piloting vessel seem to be attempting lunar orbit. 05:19 Vessel altitude 122,000 m. Stern of vessel explodes. Velocity proves insufficient to achieve orbit. 05:25 Vessel altitude 113,000 m. Vessel ejects SCP-2226. SCP-2226 begins transmitting radio signal and its maneuvering thrusters engage. Entity piloting SCP-2226 appears to be attempting lunar orbit. 05:29 Vessel altitude 109,000 m, SCP-2226 altitude 110,000 m.
05:32 Vessel altitude 97,000 m, SCP-2226 altitude 112,000 m.
05:36 Vessel altitude 82,000 m, SCP-2226 altitude 114,000 m. SCP-2226 achieves lunar orbit. 05:57 Vessel impacts far side of lunar surface, resulting in an explosion estimated at 430 gigatons in strength. Explosion releases burst of high-energy gamma rays and neutrinos. 06:03 No trace of vessel remains. Resulting crater estimated at 15 km in width and 4 km in depth. 06:35 Foundation researchers determine vessel was composed of antimatter. SCP-2226 composition also ruled to be of antimatter. 09:54 Magnetic Recovery Ship 7782 (“Faraday’s Lover”) launched from Lunar Site-13. 11:37 As Faraday's Lover begins to approach SCP-2226, the object's maneuvering thrusters engage. The entity piloting the object appears to be taking evasive action. Faraday's Lover begins pursuit of SCP-2226, maintaining safe distance of 200 m.
17:45 Maneuvering thrusters of SCP-2226 cease firing, having apparently expended their fuel supply. Faraday's Lover matches the object's velocity. 17:56 Having evacuated the air from its containment bay, the crew of Faraday's Lover activates the ship's field generators and successfully recovers SCP-2226. 20:02 SCP-2226 brought to Lunar Site-13. Preliminary containment procedures begin. Note: The antimatter explosion has been censored from scientific publications. Radar jamming has successfully prevented the detection of the resulting crater by lunar orbiters. Event Log 2226-B: Details of SCP-2226-1 activity following object recovery. 05/16/1999 After SCP-2226 is pulled into the containment bay of Faraday's Lover, an entity can be seen within the object through a transparent hatch. The entity, hereafter referred to as SCP-2226-1, adjusts the knobs and levers present on the object's control panel with its upper hands and runs its fingers over the tactile display with its lower hands. SCP-2226-1 continues manipulating controls for approximately six hours following the placement of SCP-2226 within an antimaterial containment unit for indefinite storage. This produces no noticeable effects. 05/17/1999 SCP-2226-1 retrieves a metal container from an onboard storage chest and consumes its contents. Container holds an unidentified paste. Upon finishing its contents, SCP-2226-1 returns to the object's control panel and manipulates its controls. This produces no noticeable effects. After two hours, SCP-2226-1 lies on interior floor and appears to fall asleep. 05/18/1999 SCP-2226-1 consumes another container of paste. It retrieves a small, stringed instrument from the storage chest aboard SCP-2226. For seven hours, the creature plays the instrument by holding the membrane in its mouth and using two bows to vibrate its main string, pausing occasionally.6 The creature's mouth appears to act as a resonator for the instrument akin to the sound hole of a guitar. SCP-2226-1 then places the instrument in the chest and appears to fall asleep. This behavior continues for several days. 05/30/1999 SCP-2226-1 consumes what appears to be the final onboard container of paste. 06/02/1999 SCP-2226-1 manipulates the object's controls. Its movements at first seem methodical but grow erratic after a few minutes. SCP-2226-1 forms its four hands into fists and strikes them against the control panel. The creature then tosses several of the empty paste containers against the object's interior walls before repeatedly striking the interior of the transparent hatch. This activity produces no noticeable effects or damage to SCP-2226. After two hours, SCP-2226-1 lies against interior floor and appears to fall asleep. 06/03/1999 SCP-2226-1 opens door of transparent chamber affixed to interior wall of SCP-2226. The creature places a mask over its nasal slits and mouth before lying against the chamber wall. It then closes the chamber door and appears to fall asleep. 2. This signal variation is attributed to the changing positions of the Moon, Earth, and Solar System over time. 3. A fiddle-like instrument used by the Jarai people of Vietnam. 5. Only a visual description of SCP-2226-1 can be provided as closeup biological analysis is impossible. 6. The sound produced by the creature's instrument could not be recorded as the interior environment of the unit housing SCP-2226 is a hard vacuum.